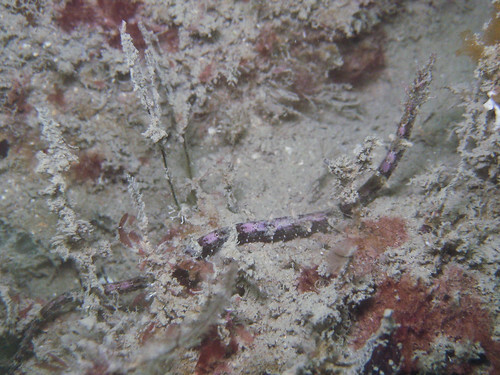 I also managed to sneak up on some gobies on the reef, but didn’t manage to get a photograph of the shrimp that share their burrows. 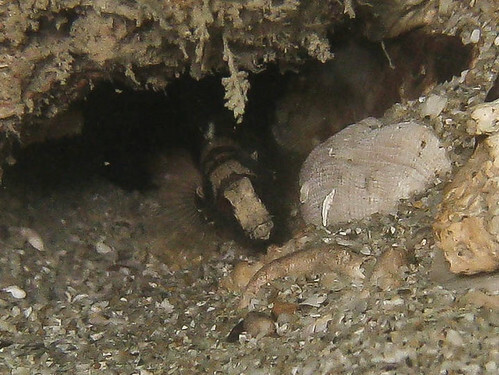 Gobies are so tricky to photograph as not only are they extremely alert thanks to huge eyes on top of their heads, but they can also dart back into their burrows within a fraction of a second. 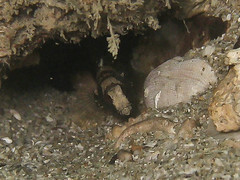 To top of all off, they are extremely patient, and can remain hidden in their burrows for an indefinite length of time! There were also a some elegant little flatworms in both plain and intricate designs. 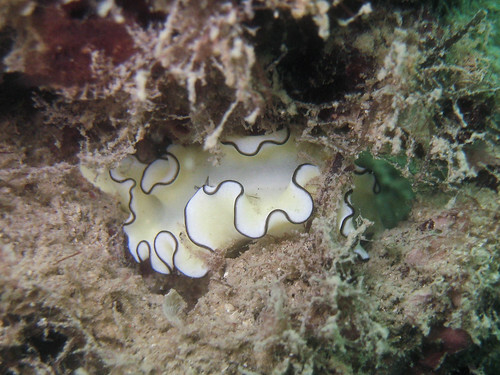 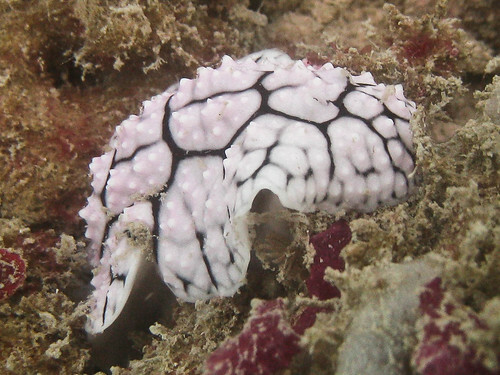 Several Phyllidia sea slugs were spotted looking like blobs of bright colours on the reef. 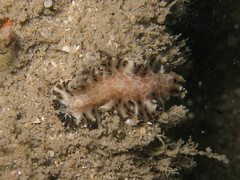 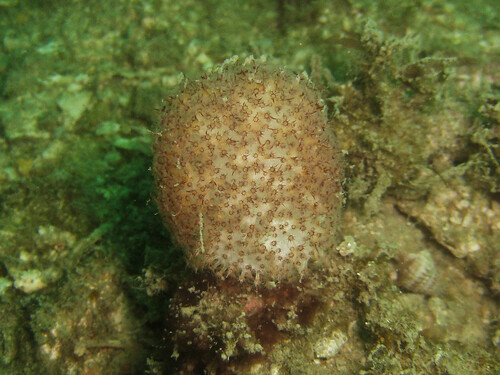 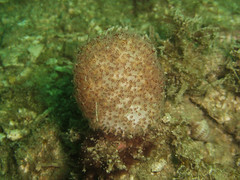 Spotting some sea slugs like this Doto sp. nudibranch on a hydroid needed some closer inspection. 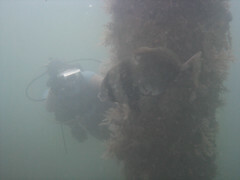 The favourable visibility this weekend gave photographers many things to photograph. Yet some of the local divers are so used to the limited visibility that we usually get, that it felt kind of strange for them! 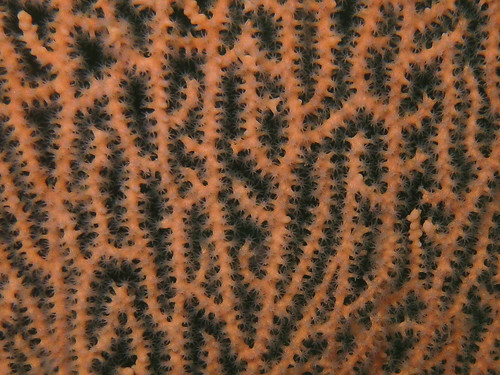 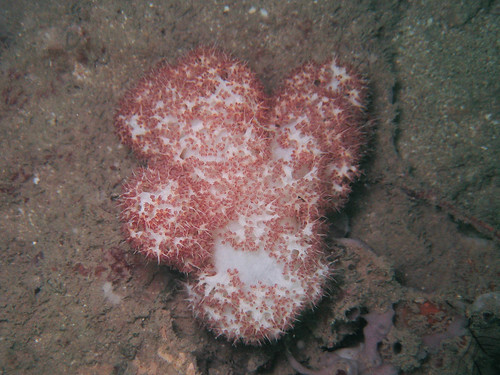 There was also some beautiful colonies of soft coral, but I didn’t have any luck finding any commensal animals on them such as porcelain crabs or allied cowries. 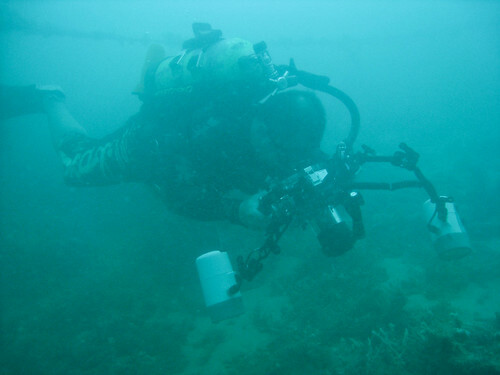 When the visibility gets good, it makes spotting big stuff a little easier. 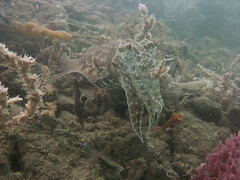 We are used to staying close to the reef and looking just feet from our faces; but on days like these, we can gaze out into the distance and spot mega fauna like this reef cuttlefish (above left) and this MASSIVE batfish! 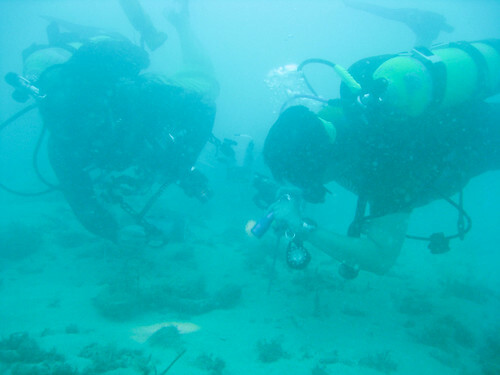 Chay Hoon, the diver that’s photographing the batfish, is more used photographing lifeforms that are a thousand times smaller, no kidding! 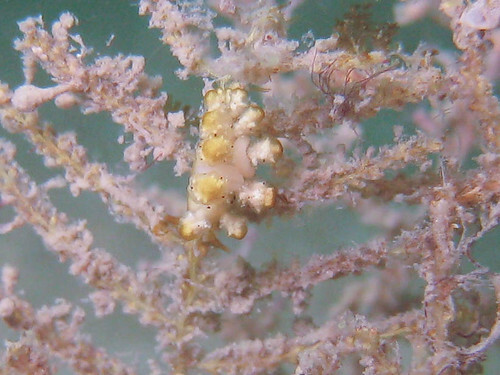 We spotted more nudibranchs, some like the Tambja sp. 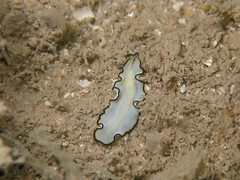 (left) were tiny, and others like the Glossodoris atromarginata (right) more conspicuous. 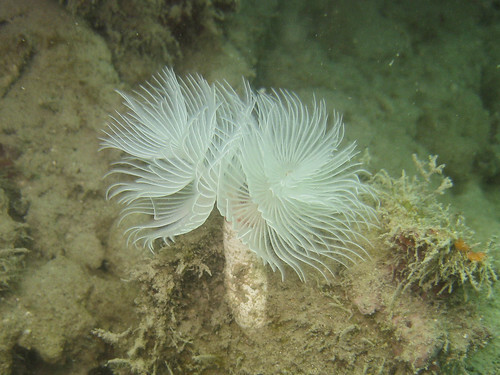 Other interesting and intriguing lifeforms on the reef were tube worms (above left) and sea pens. 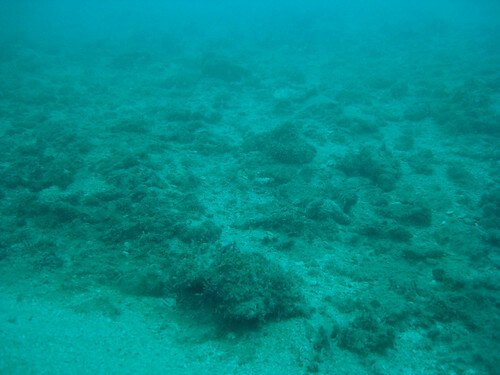 This seabed dotted with rocks and coral rubble may look devoid of life at first glance, but that’s only because the life forms that inhabit it are really good at keeping themselves hidden! 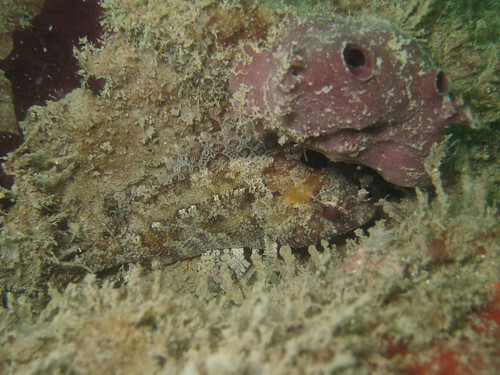 Peering into the nooks within the rocks, a False scorpionfish (Centrogenys vaigiensis) which is actually from the Grouper family (Serranidae), remains absolutely still as I approach it, and seems to have complete trust in its camouflage! 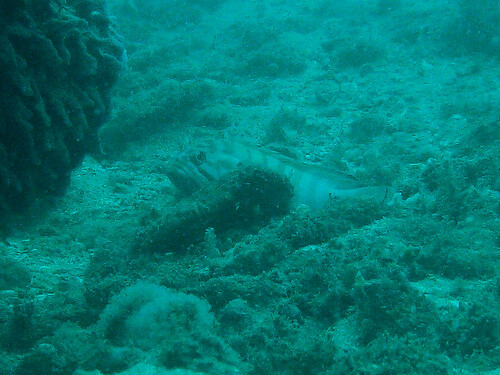 This Indian grouper (Cephalopholis boenak) that I spotted in the distance also appears invisible when looked at from a distance. 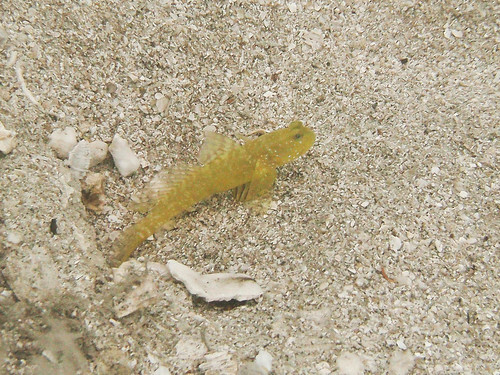 Unlike the False scorpionfish, it doesn’t trust its camouflage and shoots off to hide under a rock as soon as it spotted me looking at it! 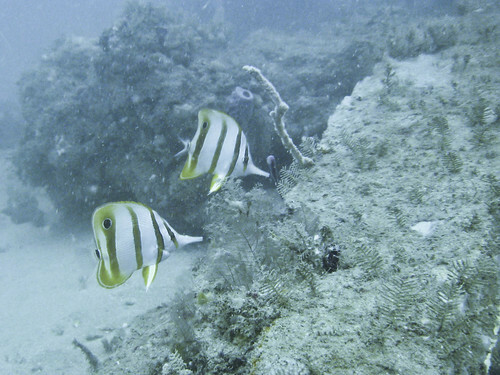 Some fish on the reef behave in curious and entertaining ways. 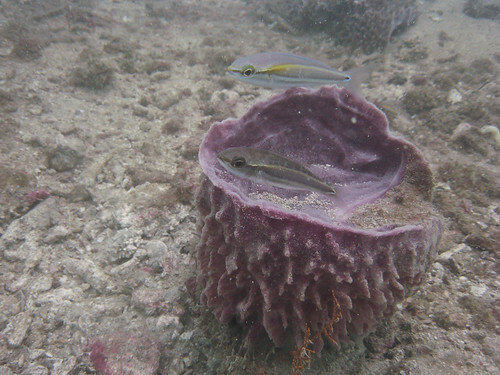 I saw this pair of Butterfly whiptails (Pentapodus setosus)playing, darting, then finally, resting on this barrel sponge. 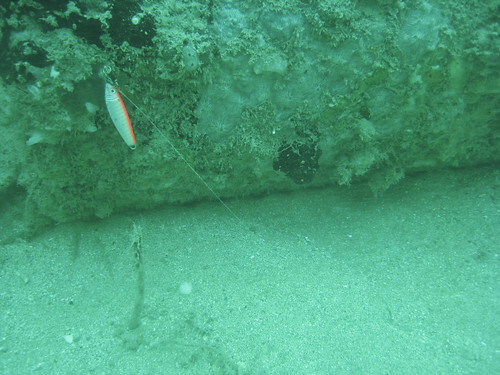 The darker-coloured fish seems to be in a state of rest at the moment of this photograph, as when it got up to leave the sponge later, its colours lightened. 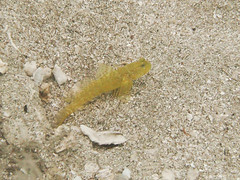 Chay Hoon spotted this juvenile Winged pipefish (Halicampus macrorhynchus), much to my delight! 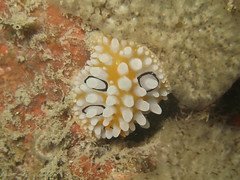 This slender creature can stay still and in one location for a long time, but can wriggle away into a crack if it senses danger. 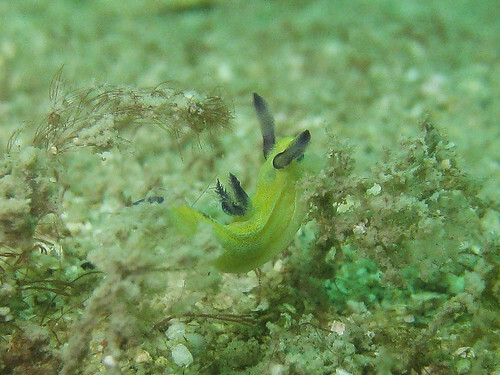 This individual seemed to be feeding as it darted its head into the space of water around it, as it picking bits of food from the drifting current. 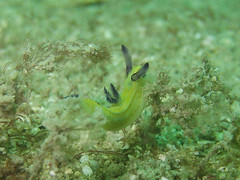 This neon-coloured fish stood out from the neutral colours on the reef and I was surprised at first but then realised it was a false bait that some careless fisherman left snagged on the reef. 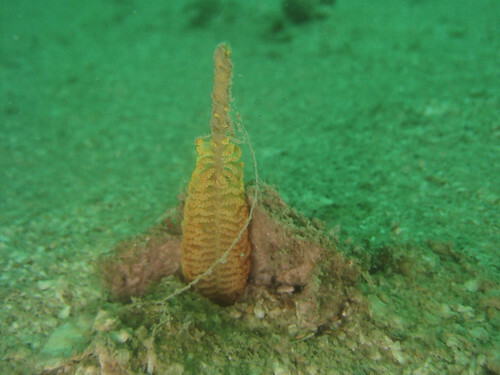 Its hook was still intact and its nylon line is practically invisible against the seabed that could entangle or kill a fish or marine reptile that commonly forage around our reefs. 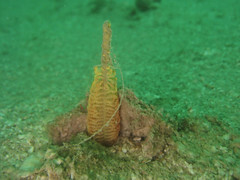 We had it removed and hope that fishermen would take care to be more careful and responsible while enjoying our coasts.